My family and I love them, especially my husband. 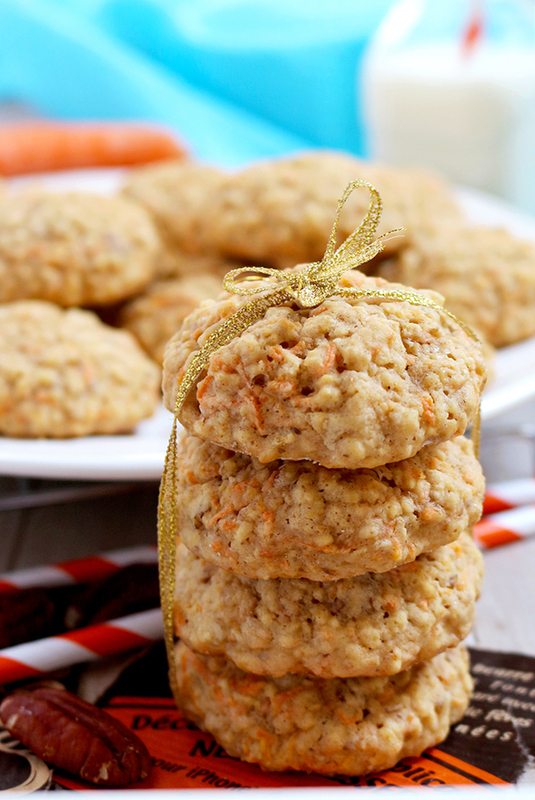 He simply adores Carrot Oatmeal Cookies, mostly because they are not too sweet. If you prefer sweeter treats, add some sugar. Check out the most popular cookies on our blog – Easter Shortbread Cookies and Valentine‘s Maraschino Cherry Shortbread Cookies Carrot combines well with both sweet and salty dishes. It is a well known fact that it is very healthy. I added some pecans, as well, because they are healthy and make cookies crunchy. There is, also, oats and spices like cinnamon, nutmeg and ginger. It is a great combination for a great start of the day. Serve them with a glass of milk, or a cup of tea, or with nothing at all- my favorite. In a large bowl, combine all purpose flour, quick oats, baking powder, ground cinnamon, ground nutmeg, ground ginger and salt. Set aside. In separate large bowl, mix butter and brown sugar, with an electric mixer on medium speed, until it is light and fluffy. Add an egg and vanilla extract and mix some more. Then, add carrots and chopped pecans and continue to mix slowly adding dry ingredients. Mix until well combined. Leave in fridge for an hour. Preheat oven to 350 F. Line two baking sheets with parchment paper. 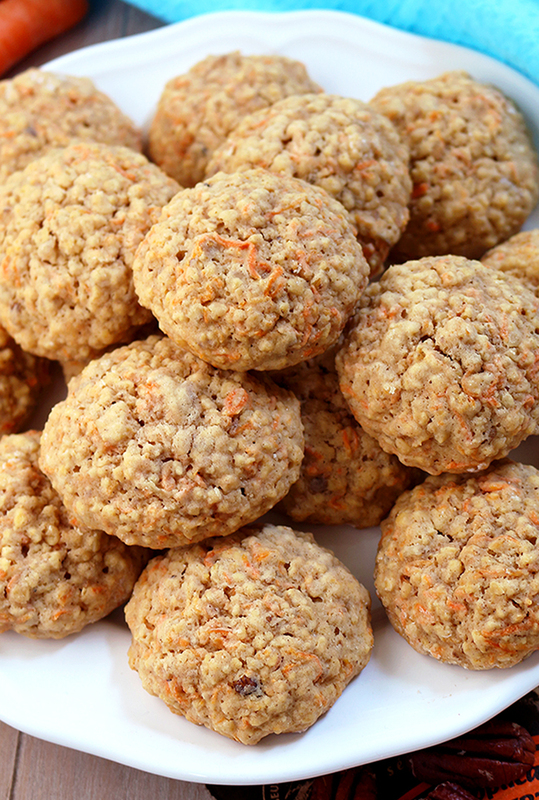 Take the dough out of the fridge and make balls using your hands (20-22 balls). Place the balls in the baking sheets, already prepared. Space between the balls should be 1.5 inch. Bake for 10-12 minutes. Take them out of the oven and let cool for a while, in the baking sheets, then place on a wire rack to cool completely. Store them in a well sealed container, at a room temperature, for no longer than three days. If you prefer sweeter desserts, add a ¼ cup of sugar. Need to replace the flour and brown sugar. Will almond flour and maple syrup work? thanks for stopping by. You can replace all purpose flour with almond flour in proportion 1:1. To apply maple syrup as a brown sugar alternative, use 2/3 cup of maple syrup for every cup of brown sugar (you should use 1/3 less maple syrup than the amount of sugar). You can add a little more flour or oats for greater strength cake. The cookies were not sweet, so I mixed together some powdered sugar and the juice of half an orange to make a glaze and topped the cookies, making them a bit sweeter and sooo good! I tried with brown sugar and healthier version of cookies. If you prefer sweeter cookies, you can add a ¼ cup of sugar. What happens to the cookies when they go past 3 days? Do they go really bad? 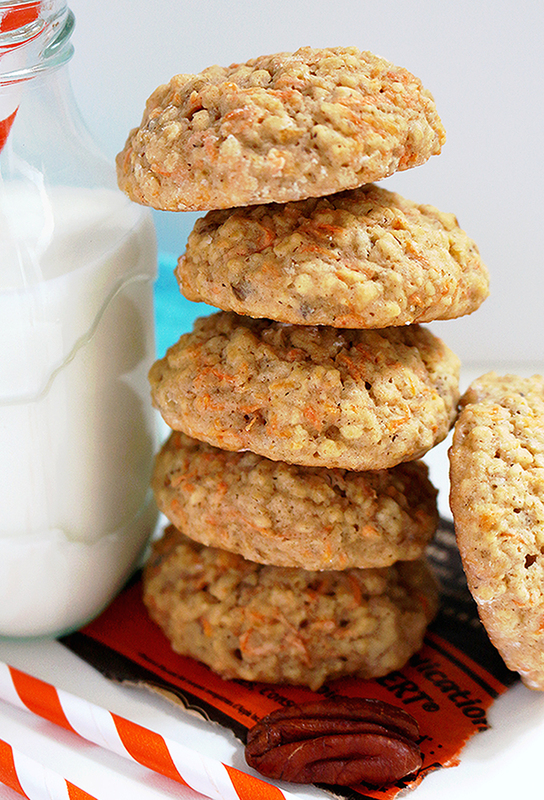 cookies tastes best first days, but if you stored them correctly you can keep the freshness. Cookies are tasty but not so much crispy. Cookies are more crunchy than crispy, but this matter of taste, as always.